Retirees can use the equity sitting in their homes to pay for their daily expenses, out-of-pocket medical bills or nursing care, especially toward the end of their lives. Cash-strapped older retirees can access that equity by taking out reverse mortgages or home equity loans or by downsizing to less expensive homes or condominiums. But one in four Medicare recipients has less than $12,250 in home equity, according to a new report by the Kaiser Family Foundation, a healthcare non-profit. 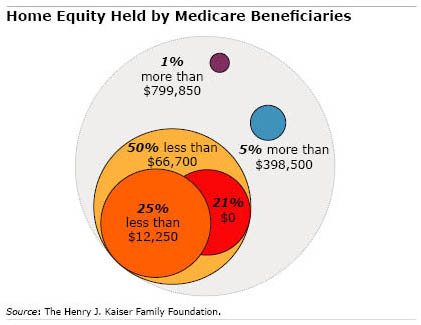 Kaiser’s calculations also show that the distribution of home equity among older Americans is – like the distribution of income and financial assets – top heavy. While 5 percent of Medicare beneficiaries in 2013 had more than $398,500 in home equity, half have less than $66,700. According to Kaiser’s projections, that gap will widen in the future. By 2030, those whose home equity places them in the top 5 percent will see that equity grow more than 40 percent, but it will rise less than 10 percent for those with mid-level – or median – amounts of equity. Less than $11,300 – that’s how little savings one-quarter of all Medicare beneficiaries have in their 401(k)s, IRAs, and other financial accounts. This grim statistic comes out of a report by the Kaiser Family Foundation, a health care and policy non-profit. Kaiser’s goal was to gauge whether older Americans will be able to absorb rising Medicare premiums, co-pays, deductibles and related costs. “Most people on Medicare are of modest means with relatively low incomes, low savings and low home equity,” concluded Gretchen Jacobson, the foundation’s associate director of the Medicare policy program and lead author of the report. When retirees’ incomes can’t cover their out-of-pocket costs, they need money in the bank to pay for care. 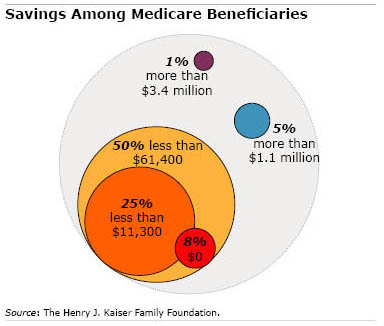 But half of all Medicare beneficiaries have annual incomes below $23,500 and have less than $61,400 in the bank – less than the cost of a year in a nursing home – Kaiser said. The foundation’s report also projects beneficiary incomes and wealth over the next two decades, as baby boomers age: much of the growth in incomes and wealth will be skewed toward individuals in the higher income and wealth brackets. About 15 percent of Americans age 65 and over are poor, according to the federal government’s alternative definition of poverty, known as the Supplemental Poverty Measure, a yardstick that takes into account seniors’ out-of-pocket medical expenses, as well as income and tax effects not included in the standard measure of poverty. A compelling new video profiles poor older Americans who live in Baltimore, rural West Virginia, and Los Angeles. In the video, produced by the Kaiser Family Foundation, a non-profit research and policy organization focused on health care, the seniors identify rising rents and medical expenses as major explanations of financial hardship, which can mean lacking enough money for food. Older Americans who are in debt are choosing to delay their retirement, researchers conclude in a new working paper. In earlier findings released last summer, the researchers, Barbara Butrica and Nadia Karamcheva of the Urban Institute, documented the growing prevalence of borrowing since the late 1990s among adults ages 62 through 69. Median debt levels among those who owe also surged from $19,000 to $32,100, adjusted for inflation – and debts as a share of their assets increased. Now comes the rest of the story. When the researchers controlled for health, financial assets, home values, and other forms of wealth, as well as spouses’ earnings and other factors that play into decisions about retiring, they found that individuals with debt, especially mortgages, behave differently than those who are debt-free. Estate Planning 101: Who Knew? Boston trust attorney Michael Puzo has seen it time and again: people procrastinate about writing a will or putting their estate in order. “It forces them to face their mortality, and they don’t want to,” he said. Even those with modest assets – a house, a 401k, and maybe a life insurance policy – should carefully make an estate plan. But are the nuts and bolts of wills and estate planning widely understood? Distributes one’s assets to the desired person or people. Ensures beneficiaries receive the money when you want them to. Makes appropriate bequests either directly or indirectly through a trust, rather than a will. When thinking about a will, get out a blank sheet of paper and write down everything of value that you own, whether it’s a checking account, the house, a wedding ring, or life insurance policy – and who you want to receive each of them. Many people may be surprised to learn they “have more money than they think they have,” Puzo said. 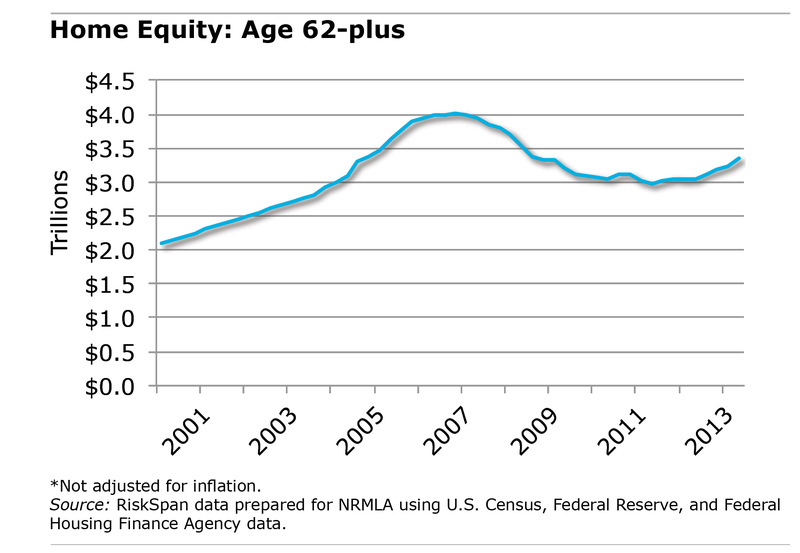 The equity in older Americans’ homes has risen smartly over the past year, fueled by the housing market rebound. But whether retirees will tap these gains to pay their bills remains in doubt. Equity values for homeowners who are 62 or older was $3.34 trillion in the second quarter of this year – nearly 10 percent above its $3.05 trillion value a year earlier – according to new data released by the National Reverse Mortgage Lenders Association (NRMLA), a trade organization. Rising house prices are restoring equity even in places like Florida devastated by the housing market bust. 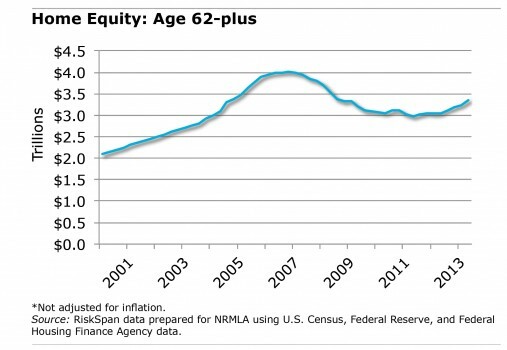 Seniors’ home equity has surged 14 percent there over the past year, to $241 billion in the second quarter of 2013, though it remains far below the levels reached during the bubble. The equity gains are not being propelled by homeowners paying off their home loans. U.S. seniors owed $1.07 trillion on their mortgages in the second quarter, compared with $1.09 trillion a year earlier, the trade organization said. When my new partner and I bought a condominium last month to accommodate our combined stuff, I remembered that borrowing so much money can be an emotional, even terrifying, ordeal. It’s difficult to think clearly. But attention should be paid to closing costs, which add to the cost of buying a house. So I decided to apply my skills as a veteran newspaper reporter and grilled my lender, attorney and real estate agent about these costs. Federal law requires prospective mortgage lenders to provide loan applicants with a “good faith estimate” of the closing costs within three days after they submit the application. This “GFE” is your lender’s best guess of the final fees they’ll charge for originating your loan.